How can I find out if a deed poll was enrolled? It’s always been possible in Great Britain, and Ireland, to change your name without having to register the change with any official body. It’s still perfectly legal for anyone over the age of 16 to start using a new name at any time, as long as they’re not doing so for a fraudulent or illegal reason. For this reason, people looking for a formal record of a change of name will often find that it simply doesn’t exist. Historically, many people preferred not to draw attention to their change of name. For example, when divorce was more difficult, some people simply took their new partner’s name to allow them to appear married, and to make any children appear legitimate. What you’re more likely to find, is a trail of records in one name, and — after a certain point in time — another trail of records in another name. The challenge is to find evidence that the two trails belong to the same person. There may not be any single document that links the two names, which can be very frustrating for researchers. changed their name by deed poll. If you’ve changed your own name and you need proof — to obtain a passport for example — please see our page on replacement deed polls. 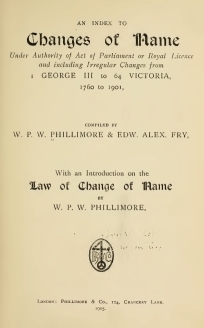 A deed poll is a kind of contract where you formally commit yourself to changing your name to something else. Usually, a solicitor or legal firm (such as Deed Poll Office) will draw up the deed poll, and the person changing their name will sign the document. The legal firm may keep a copy on file (Deed Poll Office doesn’t actually do this) — but it may or may not be a certified copy, and the file is unlikely to be kept for more than five years. People born in England & Wales can ask for their deed poll to be enrolled, for safekeeping, in the Enrolment Books of the Supreme Court of Judicature (formerly the Close Rolls of Chancery), at the Royal Courts of Justice in London. However, this isn’t free, and most people decide against it considering the complexity and expense of it. Thus many people who seek a record of an enrolled change of name are disappointed. Search the London Gazette by name for the person you’re researching. From 1914 all enrolled deed polls had to be advertised in the Gazette. Visit The National Archives in Kew and consult the indexes to enrolled deed polls. The indexes cannot be searched online. For 1851 to 1903 first consult the indexes in C 275 — they show only the former name. This will enable you to access the relevant document in C 54 . Indexes and the enrolment books for 1903 to 2014 are in J 18 . The indexes show both the former and the new name, either as a note or a cross-reference. If you cannot visit in person, you can pay for someone to do research for you . Contact the Royal Courts of Justice for details of enrolments since the end of April 2014. The original declarations were destroyed when National Registration was abolished in 1952 but you can search the London, Edinburgh or Belfast Gazettes for the published details. In 1916, enemy aliens resident in Britain were forbidden to change their names. In 1919 the ban was extended to all foreigners in Britain and was only removed in 1971. It may be useful to search the London Gazette , as it was often used to advertise changes of name in the first two instances. It’s possible under certain circumstances to record a new name on a birth certificate. When a certificate is changed, all new certificates will show the annotations, or will be issued from the new entry (depending on how the change was made). You can search the London Gazette by name for any references to changes of name. The Royal College of Arms has records relating to Royal licences. From 1783, applications for a Royal licence were either made through, or required a report from the college. Use their enquiry form to request more information. Some changes of name were made by a private Act of Parliament — usually for the same reasons as those made by Royal licence (see above). This was fairly common in the eighteenth and early nineteenth centuries, but since 1907 has only been used once. The best place to look at the Original Acts is the Parliamentary Archives in London.